strain and presented in freeze dried form. Each 5 or 20ml vial contains 100 to 400 doses of freeze dried vaccine. Store vaccine in a refrigerator at +20 C up to +80C. 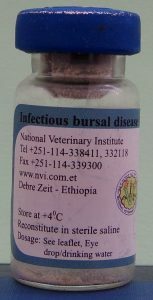 – Each dose of vaccine contains live freeze dried IBD (Intermediate Standard Strain) virus of 10 3EID 50.
completely within one hour. Follow aseptic techniques during reconstitution. using blunt needle of 15 gauges or calibrated dropper instill one drop into the eye per chick. Ensure that the vaccine drop is completely absorbed in the eye. * The waterier should be thoroughly cleaned before use. * Use clean and cool water. Small ice blocks may be added in water to make it cool. at 1 – 2 weeks of age and second vaccination at 3 – 4 weeks of age. at 3 – 4 weeks of age and second vaccination at 8 – 12 weeks of age.